That's a great name for a seasonal company that decorates homes for the holidays, don't you think? Chateau Mistletoe has just been launched by young Dallas designers Gretchen Leigh Clark and Hilary Campbell, in an effort "to prevent innocent home owners from committing holiday decor faux pas." I like that. There's so many of us out there that think Christmas decorating is only about the garish clash of green and red, and flying reindeers and a cloying Santa Claus. I'm not saying get rid of Santa or Rudolph or green trees or red lights, just that the whole thing needs to look a lot better than it has. The mainstream catalogue companies have gotten into the stylish Christmas act with some pretty sleek, simple, monochromatic Christmas designs. But there are so many people in Dallas, still with tons of money, who don't decorate well during the holidays. You know who you are, and we do, too. We have to make our way down Armstrong Avenue each X-mas to get to our mid-century modern high rise apartment building on Turtle Creek, fighting the onlookers and the gigantic mechanical snowmen and blinking red-nosed reindeer all the way home. 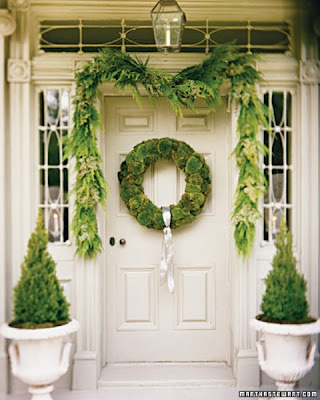 A simple green wreath punctuated by vibrant reindeer moss may not attract a gaggle of gawkers, but it would win big points in our stylish home design notebook, if we had one. Gretchen and Hilary describe the look of their new holiday design company as "French deco meets American eclectic." Gretchen, who now works part-time for Jan Showers after having a baby, has the French glamour thing down pretty well. I don't know much about Hilary yet, whose website is still a work in progress, but if the two are teamed up, there's much promise.